A lot of the things we are currently hearing in the news regarding FISA Warrants, Russian collusion, etc., would never have been revealed had Hillary Clinton been elected. That in itself is a little disconcerting. One group that has worked very hard to get to the bottom of the numerous scandals surrounding the Clintons has been Judicial Watch. They are non-partisan–they have gone after previous administrations just as hard as they are going after the Obama administration. It seems as if they may be getting to a point where Americans may actually know what went on in the Obama administration Justice Department. Conservative watchdog group Judicial Watch announced Wednesday a schedule of depositions of senior Obama-era officials, lawyers and former Hillary Clinton aides. Thanks to the heavy lifting by Judicial Watch, Judge Royce C. Lamberth ordered these corrupt Obama and Hillary officials to provide answers, under oath, to the watchdog group about the Benghazi and Hillary Clinton email scandals. Recall, Judge Lamberth previously slammed Hillary’s corruption and said the State Department provided ‘clearly false’ statements to derail requests for Hillary Clinton documents. Judge Lamberth, a Reagan appointee, said he was “dumbfounded” when he found out that Hillary’s aide-turned-lawyer Cheryl Mills was given immunity. “I had myself found that Cheryl Mills had committed perjury and lied under oath in a published opinion I had issued in a Judicial Watch case where I found her unworthy of belief, and I was quite shocked to find out she had been given immunity in — by the Justice Department in the Hillary Clinton email case,” Lamberth said during a hearing last October. Please follow the link to the article–it includes the schedule of the depositions. I have no idea where this is going, but I think it is a good thing. The Washington Free Beacon posted an article this morning about California and voting. California and Los Angeles County have agreed to purge as many as 1.5 million inactive voter registrations across the state as part of a court settlement finalized this week with Judicial Watch, a conservative watchdog. Because the states refused to supply information to the President’s Commission to study election fraud, private groups like Judicial Watch have to to the work themselves. It is good to see that the work of protecting the votes of American voters who are legal voters is proceeding. Yesterday The Washington Examiner posted an article about a recent Freedom of Information Act Request filed by Judicial Watch. Judicial Watch is an impartial government watchdog agency–they have gone after Clintons, Bushes, Obamas, etc. A conservative watchdog group announced Friday it had filed a Freedom of Information Act lawsuit against the Justice Department seeking communications records that relate the FBI’s investigation into whether Hillary and Bill Clinton’s charity organization participated in pay-to-play schemes or other improper behavior with the U.S. government. The latest lawsuit by Judicial Watch related to the Clintons, filed in the U.S. District Court for the District of Columbia after the FBI denied their FOIA request and appeal this fall, targets the offices of prominent Obama-era officials, including former Attorney General Loretta Lynch, former FBI Director James Comey, and former FBI Deputy Director Andrew McCabe. The watchdog also singled out the DOJ inspector general’s report released in April in which McCabe described a “very dramatic” call he had with another high-level department official about the handling of the Clinton Foundation probe. That same inspector general’s report, which led to McCabe’s firing, found McCabe ” lacked candor” on four separate occasions, including three times while under oath, in connection with the disclosure to the Wall Street Journal leak to push back on a report about large donations McCabe’s wife received from Democrats during her bid for the Virginia state Senate — a leak that effectively confirmed the existence of the Clinton Foundation probe. It may be that the Clintons are totally innocent of any wrongdoing. However, much of their past behavior definitely calls their honesty into question. Red State Observer recently reported that Tom Fitton, President of Judicial Watch, is investigating illegal aliens voting in Arizona. The President of Judicial Watch, Tom Fitton said Over 1,400 voters attempted to register with their alien number. “Of the 143,542 new voter registrations in Maricopa County, AZ between Jan 1-Sep 25, 2018, 1,470 registrants provided Alien Registration Numbers, meaning they were aliens not eligible to vote: @JudicialWatch investigation,” Fitton tweeted. Non-citizens should not be voting in our elections. That represents foreign interference in our elections. It needs to be stopped. (Washington, DC) – Judicial Watch announced today that it is fighting the State Department for a full production of records responsive to a Freedom of Information Act (FOIA) lawsuit for the emails found by the FBI on Anthony Weiner’s laptop. According to then-FBI Director James Comey, Weiner’s laptop contained “hundreds of thousands” of emails of former Secretary Clinton. Weiner is an ex-Congressman and the incarcerated husband of former Clinton top aide Huma Abedin. He was convicted of having sexually explicit communications with teenage girls. In October 2016, FBI investigators from its New York field office discovered Abedin’s emails on Weiner’s laptop, including data indicating the emails went through Clinton’s “private” non-“state.gov” email system. All emails of official State Department business received or sent by former Deputy Chief of Staff Huma Abedin from January 1, 2009 through February 1, 2013 using a non-‘state.gov’ email address. In an April 15, 2018, interview with George Stephanopoulos, former FBI Director James Comey stated that there were “hundreds of thousands” of Hillary Clinton-related emails that had been found “on Anthony Weiner’s laptop” in its investigation of the Clinton email scandal. In fighting the State Department’s effort to close the case, Judicial Watch refers to the State Department claim that only 3,000 of those “hundreds of thousands” are agency records and 147 total emails were unique agency records. Judicial Watch argues that the State Department has not released information on the total number of emails that they reviewed, how they reviewed them, how many emails were personal and not agency records and how the agency would have made those determinations. Again, all we know is that the FBI provided an unspecified number of emails to [the State Department], that [the State Department] reviewed the emails, and that [the State Department] identified 3,000 emails that contained evidence of [the State Department’s] activities. [The State Department] has not even attempted to explain the discrepancy between the “hundreds of thousands” of emails identified by ex-Director Comey and the mere 3,000 emails identified by [the State Department]. At this late point in the Secretary Clinton email saga, [the State Department] should not get the benefit of the doubt. This filing is part of Judicial Watch’s extensive and ongoing investigation into the Hillary Clinton email scandal. The investigation has produced numerous examples of Clinton using her non-“state.gov” email system to transmit classified information. Judicial Watch’s April 2014 pivotal revelation of the Benghazi talking points originating in the Obama White House brought about the May 2014 formation of the House Benghazi Committee. In February 2015 the State Department admitted to the court that it needed to make “additional searches” of Benghazi-related material. In March 2015 Clinton admitted to using a non-government email system. In September 2017 Judicial Watch made public 1,617 new pages of documents from the State Department revealing numerous additional examples of classified information being transmitted through Abedin’s unsecure, non-state.gov account, as well as many instances of Clinton donors receiving special favors from the State Department. On January 4, 2018, Judicial Watch revealed that at least 18 classified emails in a total of 798 documents produced by the State Department from the FBI’s investigation into former Secretary of State Hillary Clinton’s illicit email system were found on Anthony Weiner’s laptop. Thirteen emails contained classified information and discussions about Saudi Arabia, The Hague, Egypt, South Africa, Zimbabwe, the identity of a CIA official, Malawi, the war in Syria, Lebanon, Hamas, and the PLO. I have previously posted articles about the work of Sharyl Attkisson, who left the Washington bureau of CBS News after realizing that they were not interested in actual investigative reporting on the Obama Administration. She is continuing her work as an independent reporter, using the tools often used by Judicial Watch to get information from a less-than-transparent Obama Administration. The Daily Signal is reporting today that Sharyl Attkisson has filed a lawsuit against the Department of Health and Human Services to obtain information about the rollout of ObamaCare last year. The former CBS News reporter and Emmy award-winning journalist won’t be going alone; the legal group Judicial Watch will represent her in court. The lawsuit follows four unsuccessful Freedom of Information Act requests. In October 2013 and again in June of this year, Attkisson requested information from the Centers for Medicare and Medicaid Services (CMS) concerning the efficiency and security of the HealthCare.gov website. All four requests went unanswered. The 1966 Freedom of Information Act (FOIA) permits any person to request access to federal agency records or information. Federal agencies are required to disclose records upon receipt of a written request, except for records that are protected from disclosure by nine exemptions or three exclusions in the Act. We need more Sharyl Attkissons! Sharyl Attkisson continues to investigate the Benghazi cover-up and report on her findings. She is doing the job that CBS News should have been doing when she worked for them. Yesterday she posted an article at sharylattkisson.com with a link to a Department of State email showing that the State Department knew almost immediately that the attack at Benghazi was the work of Islamic militia terrorist group Ansar al Sharia. This is the link to the email. 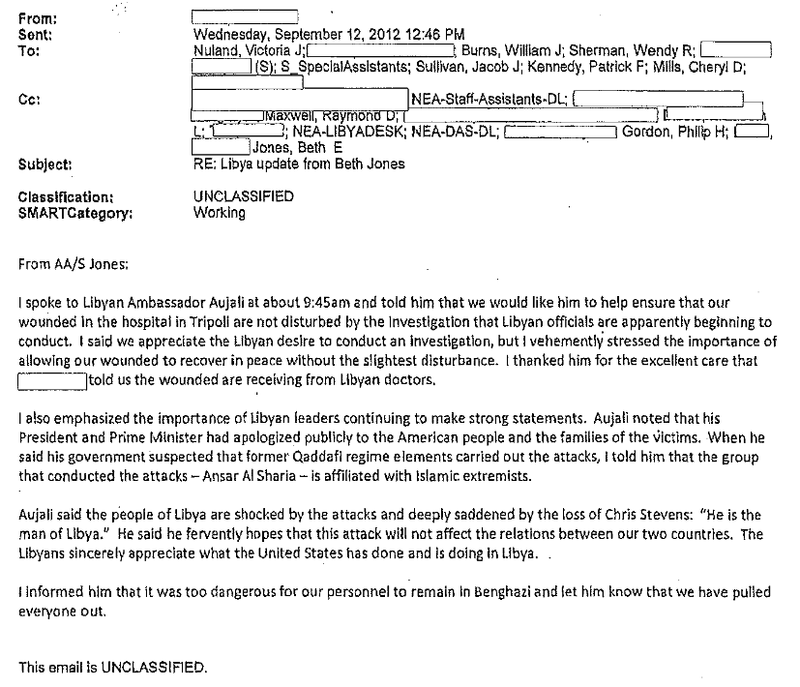 The email is from Beth E. Jones, then-Assistant Secretary of State to Hillary Clinton. There is no uncertainty assigned to the assessment, which does not mention a video or a protest. The State Department provided the email to Congress in Aug. of 2013 under special conditions that it not be publicly released at that time. Rep. Jason Chaffetz (R-Utah) sought and received permission to release it Thursday. Why is this information coming out now? Because enough people have realized that there has been a cover-up of what actually happened at Benghazi, and many officials (as well as the American people) are tired of being lied to. The Obama Administration has successfully withheld documents and information about the Benghazi attack and the death of Christopher Stevens from Congress and the American people until very recently. It is because the Freedom of Information Act (FOIA) and those organizations such as Judicial Watch that we are becoming aware of the truth. Hopefully, when you vote in November, you will remember who helped with the cover-up and who helped reveal the truth. This article has two sources–GoLocalWorcester and Judicial Watch. A study by the Colorado secretary of state found that nearly 5,000 noncitizens voted in Colorado’s closely contested 2010 Senate race. According Georgia Secretary of State Brian Kemp, after a photo ID law in 2008, the number of African-American voters has increased more than ten percent. Additionally, all voting demographics have grown at the rate of population growth. Moreover, prior to the passage, they investigated and penalized hundreds of people guilty of election and voter fraud every election cycle. An article in the in the Pittsburg Post-Gazette tells us that of 1.3 million new registrations ACORN turned in 2008, election officials rejected 400,000. Do you suppose they caught all of the bad ones? 1.8 million deceased individuals are listed as active voters. And in our City of Worcester, when the Worcester voter census was finally brought in compliance with state law in 2011, some 45% of voters were classified as “inactive”. …Preserving the integrity of the election process has been a huge issue for Judicial Watch over the years. Just last week JW launched the 2012 Election Integrity Project to pressure states and localities to clean up voter registration polls in order to comply with Section 8 of the National Voter Registration Act (NVRA). A lengthy JW investigation of public records indicates that voter rolls in numerous states have more registered voters than voting-age population. Meanwhile, in its February 2012 newsletter, Judicial Watch reported that through records obtained through the Freedom of Information Act (FOIA), they have learned that there has been extensive communication between the Department of Justice and Estelle Rogers, a former ACORN attorney currently serving as Director of Advocacy for Project Vote. This close relationship is not healthy for our democracy or for our next election.